Employee engagement is vital for any organisation that wishes to grow! You need to create a culture of learning and growth within your business and you will maximise the talent of your team and see a greater return on your investment. Attracting the best people to your business and subsequently keeping hold of them is one of the biggest challenges for any growing business. Engaging with your employees is a key factor to motivation and retention. People who feel valued as an individual and are included in the company’s goals, will work harder, smarter and feel appreciated. Employers are finding that top candidates are hard to find, expensive and often snapped up by high-profile blue-chip companies. Maximizing the skills available to you within your own organisation is far more beneficial and profitable. Employee Engagement is often confused with the idea of employee satisfaction. While the two are related, they are unique. Satisfaction has to do with contentment, while engagement is about connection. We may see an employee who is satisﬁed with their salary and the people they work with, but that doesn’t mean they are engaged. An engaged employee is someone who is more than satisﬁed. They are inspired, interested and committed to their work. In some ways, being engaged can be considered the opposite of being burnt out. A burnt out employee feels cynical about their work, but when employees are engaged, they are positive about what they do and how it contributes to their personal and company-wide goals. Employee Experience begins the moment someone starts the application process at your organisation to the day they take their exit survey after leaving the company. This experience isn’t static. In fact, it can change from day to day. While employee experience can and will ﬂuctuate over time, it’s useful to think about it in terms of key milestones in the overall employee lifecycle – candidate onboarding, training, exit, alumni. Employee Effectiveness as the next generation of performance reviews. They both communicate how an individual or team is doing, but employee effectiveness also empowers individuals and teams to drive their own development. It’s not about telling them what they need to do, but giving them the feedback and the resources to decide their own career path. When the right criteria and metrics are used, employee effectiveness also eliminates the biases that often occur with subjective performance reviews. Untangling what employee engagement really means can be complicated, but that doesn’t mean it needs to be confusing. Once you understand how it can bring benefits to your organisation, you can start to build a feedback platform to gain better insights about your employees. If you’d like to learn more about employee engagement and how it can really help you to grow do give me a call on 01280 700405 or click here to ping me an email and let’s see how I can help you. A strategic process for business success ..
f your price isn’t right then you’re going to be losing money! 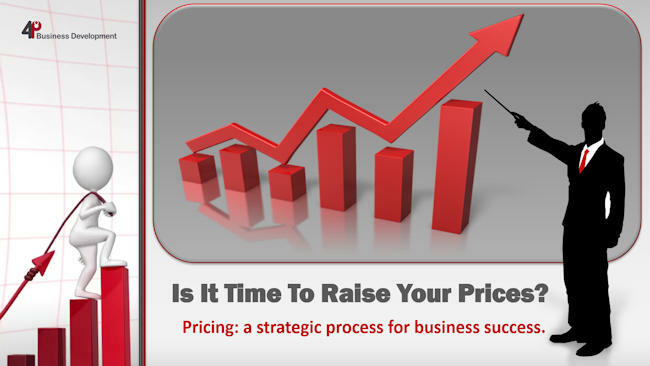 Get your pricing strategy wrong, and you may well create problems that your business may never be able to overcome. The first thing you have to understand is that the price you get to charge is a function of your ability to sell and nothing else. For some companies, the pricing strategy for products and services is based purely on a combination of covering costs and making a profit. Smart businesses understand that you can fail to gain new customers just as easily because your price is too low. When customers leave you, it has very little to do with how much you charge, it is much more likely to be that they perceive that “you do not care”, so never be afraid of raising your prices. Customers who are disgruntled about price increases are the minority, and any losses from leaving customers can be compensated by increased profit margins from your new higher prices. Reviewing your pricing should be done at least once a year. Remember, as costs go up your profit goes down, so if you don’t put up your prices then eventually, you’re not going to make any profit at all and, well, you know what happens to your business then? If you’d like to talk about your profitability, or indeed review your business to see what your pricing should really be, you can call me on 01280 700405 or click here to ping me an email and let’s see how I can help you.